These easy to make Ginger Wasabi Deviled Eggs are not your grandma’s deviled eggs. 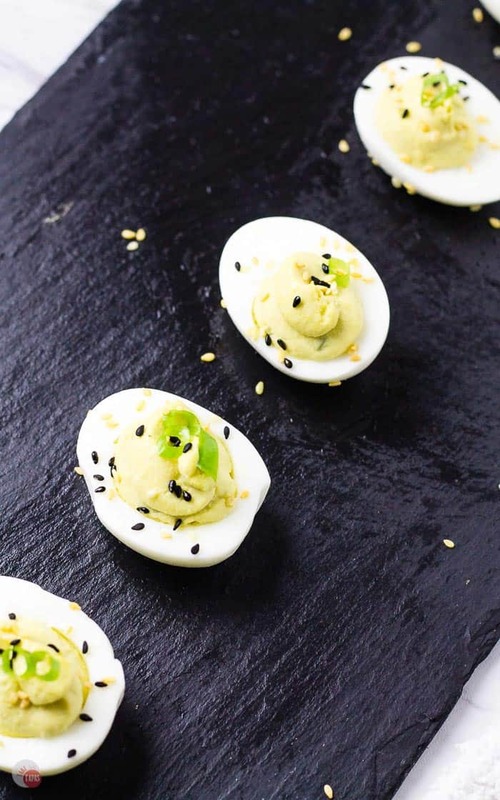 Asian-inspired with a bit of heat, they will change the way you think about deviled eggs forever! The holidays are officially over, most have recovered from the gift-giving sticker shock, and looking forward to a nice quiet spring full of organizing and cleaning. As someone who loves to entertain, this time of year leaves me feeling anxious because it’s TOO quiet. The big game is over and the next big holiday for party food is Cinco de Mayo. The same day as the Kentucky Derby this year! Two big party occasions on the same day? Can we have Derby Pie and Bourbon Balls along with our margaritas and tacos? You most certainly can!! If the slump of quiet time has you refocused on cleaning, organizing, and doing your taxes, you might be caught unawares when someone stops by for a surprise visit! Maybe they are trying to escape the mess they made while trying to clean up, or they are sick and tired of hearing the adding machine click away. Whatever the reason, they are at your door and you don’t have anything to offer them but leftovers and a warm bottle of wine. What do you do? One of my go-to recipes is deviled eggs. I almost always have eggs in the fridge, unless Brooks has been on the Paleo kick and ate them all in his 9-egg omelet. Making hard-boiling eggs for deviled eggs is pretty easy. 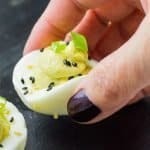 I talk about the perfect method for making easy-to-peel hard-boiled eggs when I showed you how to replace the mayo with avocados. But, if you find yourself out of raw eggs, I hope you have some store-bought ones on hand. Normally, I wouldn’t tout buying pre-made hard-boiled eggs, but I found some organic ones at the store and they last a few weeks in the fridge. I love to eat hard-boiled eggs for breakfast with a sprinkle of salt and pepper and a dash of hot sauce. The best part of these pre-done eggs is that they are already peeled. I freaking hate that job!!! So while your guests are getting settled in, pull out your eggs and a few other ingredients and let’s whip up something special. The secret to being able to whip up something fantastic in a hurry is to be prepared! Quite a few of my friends plan meals and have those ingredients on hand and maybe a few random other items. In my post about entertaining unexpected guests, I list a few essentials that are shelf-stable and can transform something simple into something spectacular. 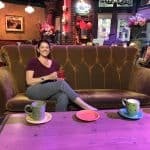 Making your house the one people want to pop into all the time! The items like olive tapenade, dried fruits, and cured meats make a great cheese board. To take it over the top you need a bit of freshness. The best way to do that is fresh herbs! Fresh herbs are amazing and elevate any dish but what if you don’t have any? If you have been reading Take Two Tapas for a while you have heard me talk about my gardening skills and lack thereof. I believe the correct name for my affliction is called “Black Thumb.” I can’t even keep my plastic plants alive for more than a week. How do I get fresh herbs all the time? If you are a Black Thumb like me or don’t have a garden bursting with fresh herbs, how can you get this freshness? I don’t want to head to the store every time I need a few sprigs of cilantro? Dorot Gardens is here to save the day! 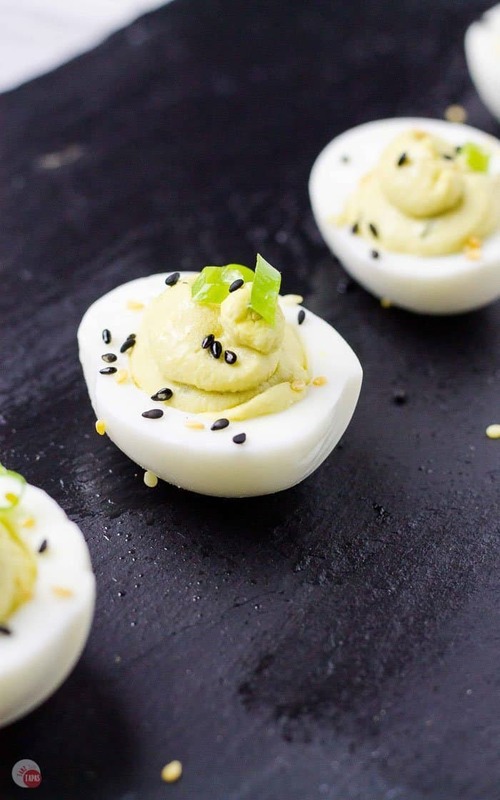 Ginger Wasabi Deviled Eggs with much-needed help! Found in the freezer section, Dorot Gardens fresh herbs are cleaned, chopped, and measured into perfectly-portioned cubes! The herbs are found in the freezer section but before they are frozen, Dorot Gardens harvests the herbs, processes, and flash freezes them within 90 minutes. All the freshness is sealed in and is the answer to all your culinary prayers! No knife wounds on your hands or the hands of your little kitchen helpers! A two-year shelf life means fewer trips to the store! By the way, you don’t have time to go to the store if you have unexpected guests. So with the help of some hard-boiled eggs and Dorot Gardens Ginger, I can make an amazing appetizer such as these Ginger Wasabi Deviled Eggs! The already prepped ginger adds so much flavor to the egg yolks along with the kick of wasabi! 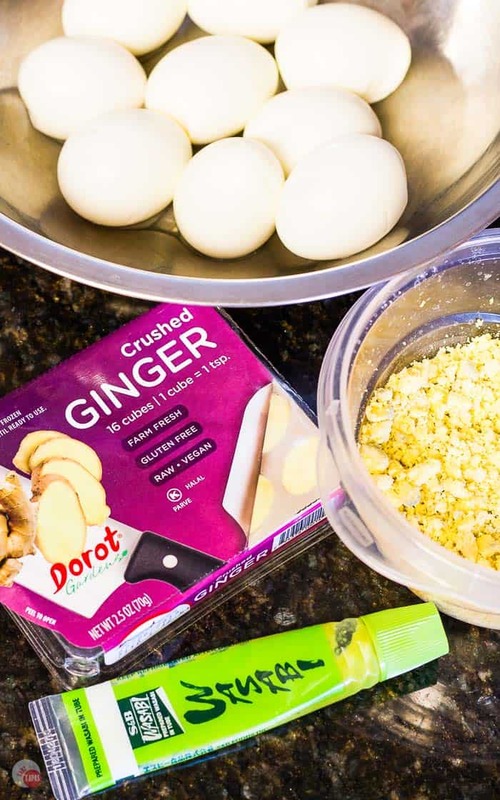 I wouldn’t have had time to prep these delicious Ginger Wasabi Deviled Eggs without the help of Dorot Gardens. Last year I made an Amazing Pineapple Ginger Prosecco Punch with both Dorot Gardens Ginger and Cilantro and it is a hit! These easy to make Ginger Wasabi Deviled Eggs are not your grandma’s deviled eggs. Asian-inspired with a bit of heat they are perfect! Mix yolks with mayo, soy sauce, wasabi, and ginger. I LOVE Dorot and even quit growing garlic because they are so convenient. I love this recipe and can’t wait to try it. We love devil eggs and they’re perfect for the leftover Easter eggs! I love hard-boiled eggs and these are like a walk on the wild side!